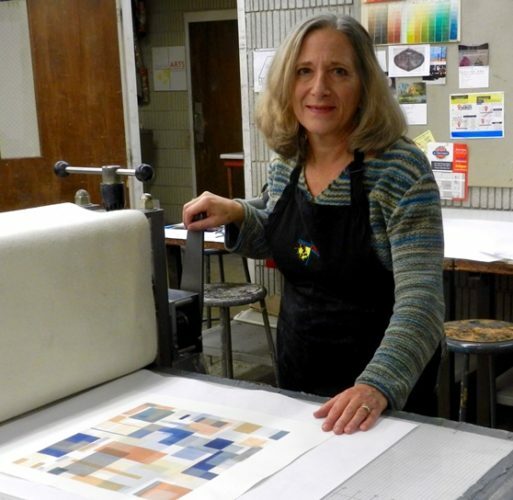 CHESTER — Try your hand at making a monotype print with Maple and Main Gallery artist Cathy DeMeo on Sunday, July 17, from noon to 2 p.m.
DeMeo, Maple and Main’s Focus Artist of the Week, explains, “Monotypes are a painterly form of printmaking made by applying ink or paint to a smooth plate, then transferring the image to paper using some form of applied pressure.” She will demonstrate monotype printing techniques and will show visitors how to make a simple print themselves. A special selection of DeMeo’s work is on display at the gallery through Sunday. Why on Sunday? Because Chester hosts “Always on Sundays” and each Sunday, galleries, shops, restaurants present special offerings to visitors. In warm-weather months, these offerings are companion pieces to the town’s widely popular Sunday Market from 10 a.m. to 1 p.m.
More information on Maple and Main Gallery is at www.MapleandMainGallery.com or by calling 860-526-6065.